During February, there are a few annual month-long food things, all of which I've tried to celebrate, none of which I've made it to. Until this year folks. I set my mind to it, and for one particular event, I was going to get a side bonus of pretzel croissant. 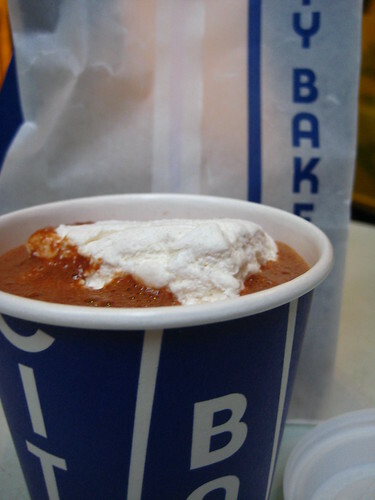 The City Bakery is currently in its 18th Annual Hot Chocolate Festival, today being Milk Chocolate Hot Chocolate. But two Saturdays ago, it was Caramel Hot Chocolate, and I was there, sipping to my heart's content. The virtues of their hot chocolate are all over the interwebs-like a liquid semisweet chocolate bar is my personal favorite. I always get mine with marshmallow. The caramel flavoring did bring it to cloying, I could only finish about half before being worn out. But the hot chocolate wasn't the highlight of this stop. Let's sidetrack: five and a half years ago I spent the summer in Paris and fell head-over-heels in love. Brownie knows that if I ever run away, she can find me there, munching on jambon, baguette and macarons. My perfect hometown, and I know I'm not alone on this, would be a hybrid of NYC and Paris. 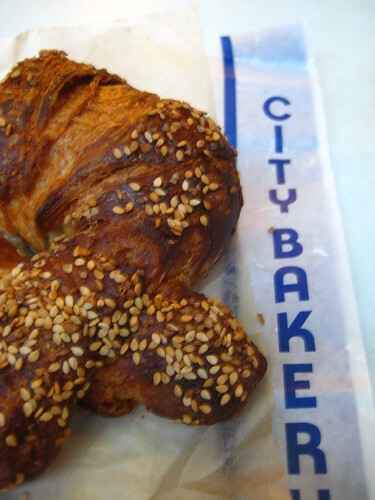 In that hybrid dream town, The City Bakery's pretzel croissant would be the breakfast of choice. 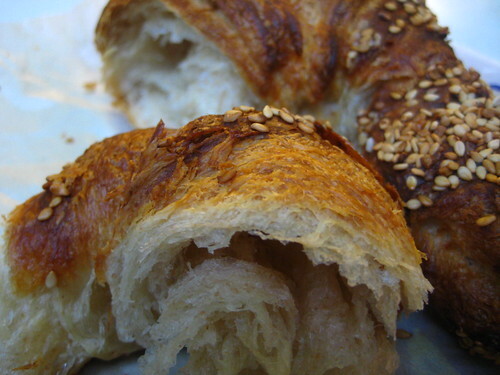 Sesame-y, buttery, flaky, crunchy, crisp, joy, and beauty. I'm in love with it too.